Their existing signage included changeable copy boards, where only one message at a time could be displayed. Manually changing the message was not only time consuming and dangerous, but the black plastic letters on white plastic background weren’t aesthetically pleasing to customers. Attracting more customers by displaying tantalizing images of food KFC served was paramount. Vangeloff Management wanted to promote desserts and sides to increase their average sale. They also wanted to expand their catering business. Our national sign company partner, Identicom, provides permitting, project management, and installation services. Their assistance allowed Electro-Matic’s new Fusion electronic message center to deliver the images and messages that met the goals and exceeded the expectations of the customer. So far, the two signs upgraded are both 11mm high resolution displays. The images are crisp and clear. Electro-Matic/Identicom supported all facets of the project from attending the zoning meeting, all the way through provision of K FC content on an ongoing basis. Vangeloff Management has seen an increase in both unit sales, revenue per sale, as well as expansion in their catering business. In addition to meeting all their original objectives, they’ve also found it beneficial to use the sign for “help wanted” advertising­—as finding competent workers has always been a constant challenge for them. In the project, we used Electro-Matic 11mm Fusion displays. 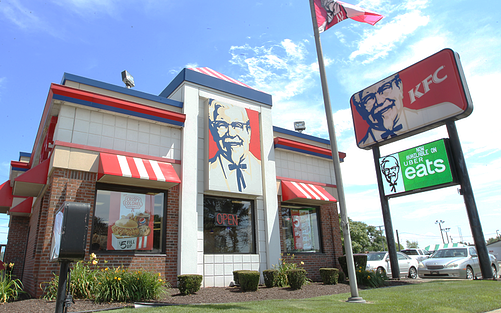 We continue to reformat graphics from KFC’s advertising agency every two to three months to fit the customer’s display. Identicom Sign Solutions provided permitting, project management, and installation services. We aggressively investigated other LED display companies, but only Electro-Matic had the right mix of product quality, price, support, and most importantly to us, customized KFC ad agency content for each promotion. We are delighted with our new sign.